That is the view of AfricArena chief executive officer (CEO) Christophe Viarnaud, speaking during a panel discussion on corporate-startup partnerships at the recent MEST Africa Summit in Cape Town. He said in an era where execution and innovation increasingly are key, businesses cannot thrive in an environment where all their resources are prohibiting innovation. The world’s most successful organisations use distributed teams that are agile. “Companies are going to move as a network of teams and individuals working together. Whether they are employed by the company, contracted by the company or startups working for the company, it is becoming very close,” Viarnaud said. One company that has realised this is German health giant Merck, which has launched an innovation centre at its headquarters and is expanding its e-health accelerator programme across Africa. Munya Chivasa, head of Merck Accelerator, said Merck employed almost 20,000 scientists, but was looking for assistance from startups when it came to technology. “We see a big benefit in working with external partners. We have a strategy within the company of becoming a science and technology company. We do the science in an amazing way. The tech part can be a bit tricky for us,” he said. Otema Yirenkyi, head of channel enablement at Vodafone, said working with a startup helped a corporate see the edge of innovation. “You have your roadmap and defined architectures and sometimes you can’t go out of that so quickly. A startup helps you to future-proof yourself and then you collaborate together,” she said. 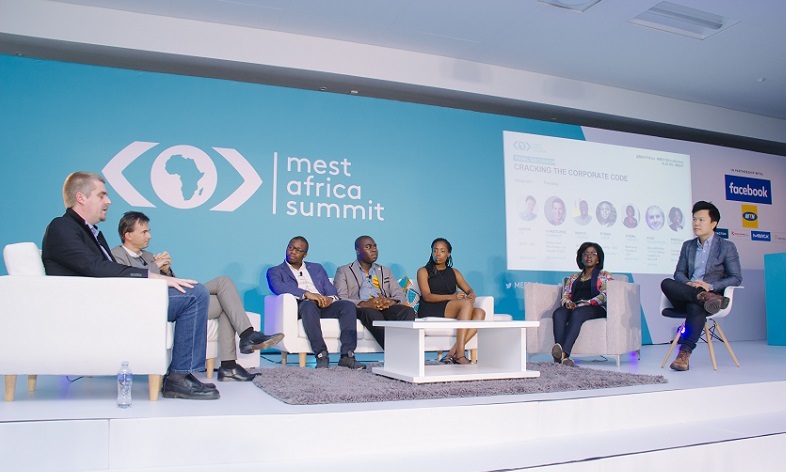 MEST managing director Aaron Fu agreed that many corporates were turning to startups, but said there were challenges involved in the process. “A lot of startups really struggle to work with corporates, and very often it is just a misunderstanding in terms of where you are coming from. We really do see the push and desire from both sides but that last mile always seems to be a bit of a challenge, and some have ended pretty badly,” he said. Panellists were agreed on this front. Viarnaud said he had seen a lot of struggle and failure in corporate-startup partnerships, mentioning one startup that took one year to integrate with a corporate sponsor after winning an event. “If you think about the IT infrastructure weight of corporates, to integrate a little startup that comes with a payments system for example, is hard,” he said. Yirenkyi agreed these were challenges. “You’re not going to uproot your technology for an innovation to future-proof you, and also you have a defined procurement process, as well as very importantly your contracting process. And so if you’re a startup, understanding that bridges that gap really quickly,” she said. As CEO of Ghanaian gaming startup Leti Arts, Eyram Tawia has much experience of working with corporates. He had some advice for startups seeking such partnerships. “My team is always very frustrated with requirements. But the successful bit for us is having the open heart to understand corporates. These are very big organisations. If you meet the CEO of a big corporate, don’t talk with him about implementation. Look for a branch head, or even an agency that works with them,” he said.